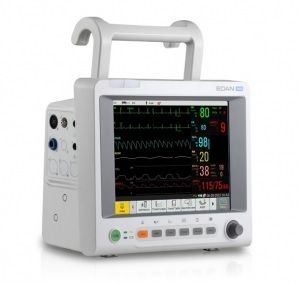 With selectable optional parameters including IBP, cardiac output and capnography, iM60 can adapt to a wide range of sub-acute divisions. The high resolution color TFT-LCD together with the up-to-date customizable shortcut menu design brings easy one-touch access to frequent used functions, allowing more attentions to the patients. Employing low-power consumption design, iM60 is with fanless structure which creates no noise and no dust accumulations. Being embedded with various communication capabilities including HL7, LAN, built-in Wi-Fi, Nurse Call, and Defibrillator Synchronization, iM60 can easily communicate and co-work with hospital information system and other hospital facilities. *iM60 and iM70 cannot be sold into the dental market.